An anechoic chamber is a shielded room that has absorbing material applied to the walls, ceiling, and floor. Chambers may be table top sized enclosures, but are normally room sized enclosures where engineers can enter and work. The absorbers on the inside surfaces are often pyramidal shape, and give the room an unique “science fiction” look. You may have also heard that they are very expensive. So why would anyone go to all of this trouble? Because there are many benefits to antenna testing! At Antenna Test Lab Co, we often find that comparing antennas and radio wave energy to light is helpful to our customer’s understanding of basic concepts. We often illustrate the anechoic chamber’s functionality with the following flashlight comparison. Imagine your task was to “pattern” a flashlight. In other words, your job is to measure and create a map of where the device shines light, where it does not, and how much light goes where. It may seem intuitive, and that is because nature has equipped us with eyes, very sophisticated built-in light sensors. We are used to simply “seeing” light and it’s patterns, so it is easy to visualize a flashlight’s pattern. However, we cannot see radio energy, directly so we have to measure it with radio receivers and antennas. Luckily, the propagation is very similar, so continue to visualize light from the flashlight. Now back to our task … patterning the flashlight. Imagine you have a light-meter, and will use it to measure the flashlight’s output in various directions to create the pattern of the flashlight beam. We would be using an antenna a receiver to do the same for patterning an antenna. You start the job and quickly discover that your light meter readings are being interfered with by the sun. Outdoors on a sunny day, your light meter is picking up lots of sunlight, and confusing that with the flashlight’s light. You need “shielding”. So you go indoors, to a windowless room, with the lights turned off. In this “dark room”, all of the observed light is from your flashlight under test. The room is shielded against outside light, just like the metal walls of an anechoic chamber shield our equipment from outside radio signals. Inside the chamber, only the radio frequency (RF) waves from the antenna or transmitter under test are measurable. This would be the perfect solution, if it were not for one problem … reflections ! 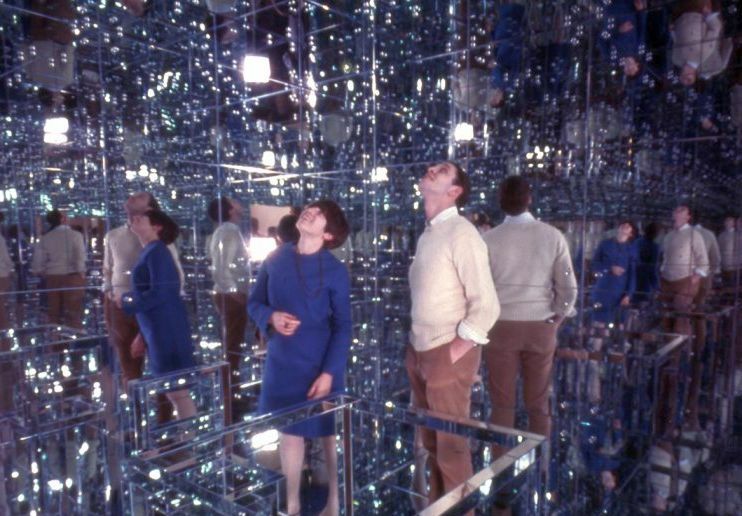 Imagine the room you just chose was lined with mirrors. It is still a “dark room” and it is fully shielded from outside light. 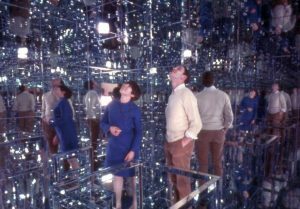 However, the mirrored wall/ceiling/floor reflections will cause chaos with your flashlight measurements. What can be done? You decide to paint over the mirrored walls, floor, and ceiling with a flat black paint. A paint so black that you can’t see it, one that absorbs all light. Now you have an optical anechoic chamber. The light that would bounce from the mirrors is like an echo, and anechoic means without echos. Now your flashlight under test appears to be in free-space. There is no ambient light, and the walls are not visible. 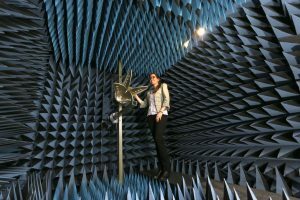 In the RF world, the reflective walls of the shielded room are made “invisible” or “anechoic” by covering them with RF absorbing materials. 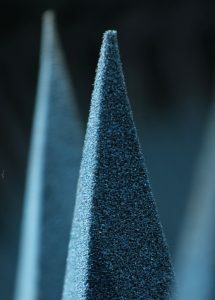 The most common absorber is a carbon loaded foam pyramid. Sharp tips on the absorbers keep RF waves from bouncing off, allowing the waves to slowly transition from air to the lossy carbon inside of the foam. This gradual taper from tip to core is the secret to RF absorbers. The amount of RF that bounces off of anechoic chamber walls is often 0.1% to 1% (-30 to -20 dB) of the original wave. The low level of reflections in our chamber allow us to accurately measure your antennas gain, efficiency, and radiation patterns. Find out more about how we do it in this educational article. The walls, ceiling, and floor of our chamber are treated with over 2000 absorbing pyramids! The absorbers are between 12″ and 18″ long. We have an additional absorber in our chamber, called a ferrite tile. 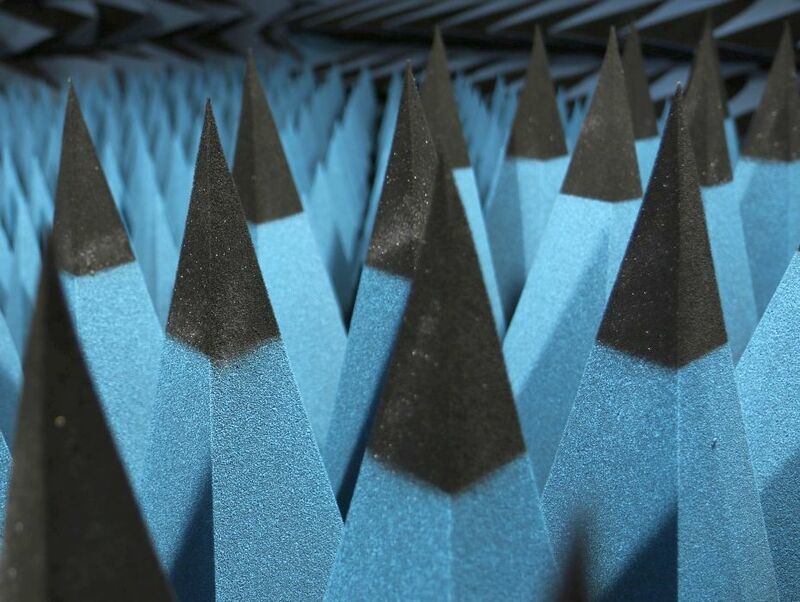 The ferrite tiles absorb RF at frequencies too low for the foam pyramids, and extend the anechoic ability of our chamber down to frequencies far below many antenna testing chambers. We routinely test antennas down to 300 MHz. Drop us a note, and see how we can help get your antenna project and costs on track ! 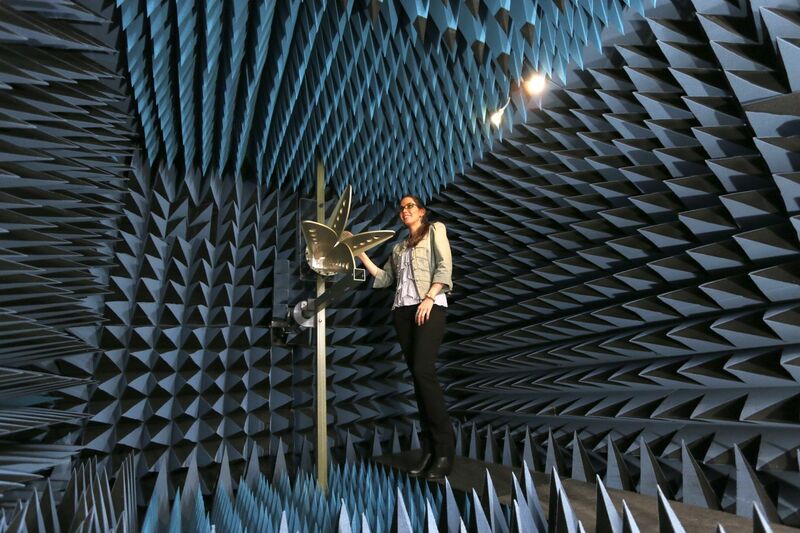 Many successful companies partner with an antenna testing service, and reap the benefits.